With the close of the Great War came the closing chapter of Weddington Castle. Following the end of the war, the Red Cross withdrew from Weddington Castle and it was put up for auction in 1919, although it failed to find a buyer. In 1922 however, Henry Nigel Pole Shawe sold the Castle to Percy Harold Howe, through the agents Nixon, Toone and Harrison, for £7,000. Howe - an electrician by trade - intended to convert the Castle into luxury flats, and on the 22nd September of that year plans were published to that effect, which also detailed plans to build houses on the Estate lands. Brief descriptions of the Castle were included in these plans: such as the entrance hall with polished oak floor (measuring 22' x 11'); the library with polished oak floor (29' x 19'); a marble chimney piece etc. The gardens' gravel walks were described as being studded with 4 old cedars, a rose garden, glass houses, a vinery, a greenhouse and a peach house. Throughout 1922 the Shawe family lobbied for the Estate to be converted into a housing development and plans for this were extensively discussed at meetings during 1923 and 1924. Numerous objections were raised over the necessity for housing and the inadequacy of sewerage arrangements. With the rapid expansion of Nuneaton such concerns were high on the priority list of the local authorities (indeed in 1930 one in ten houses in Nuneaton was classified as unfit to live in). 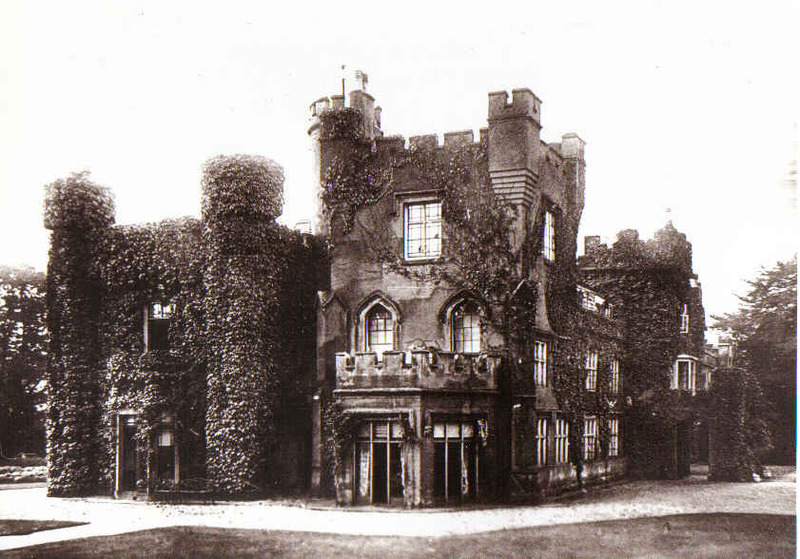 Meanwhile, from November 1923 to July 1924, the Castle was converted into flats. This was to be the fate of many similar Halls in the area such as Lindley Hall and Caldecote Hall. In the country as a whole, more widespread changes were happening. Between 1920 and 1940 Britain was faced with industrial problems. Nineteenth century industrial techniques had already peaked and were no longer appropriate in a competitive world. British technology had been in decline since well before 1914. Post-war Europe was in chaos and a return to the Empire days of before simply did not happen. The basic industries of coal and textiles never recovered from the slump they were in at the end of 1920 - this would have had a significant impact upon Nuneaton as these were key industries in the area. During the latter half of the 1920s however, the rapid growth of nearby Nuneaton began to spread to Weddington, bringing with it a need for greater housing. This reflected national trends whereby there was a great building boom: one third of all houses built in the UK by 1939 had been built in the short period since 1919. By the time Nuneaton incorporated Weddington in 1931, Weddington's population had shot up to 643 and the area of the former parish of Weddington had by then grown to 881 acres. It is ironic that whereas in previous centuries migration of workers from Weddington to larger towns created the rural space for the Weddington Estate to develop; it was the expansion of workers' accommodation in Nuneaton back into Weddingon in the Twentieth Century, that led to its demise. In 1920, on 12th October, the Lindley Hall estate was listed to be sold by auction. In 1924, on November 27th, the Caldecote Hall estate was auctioned. In 1926 Lindley Hall was demolished. In 1928, from 17th to 19th April, furniture and effects at Camp Hill Hall were sold off. In 1932, on 29th January, Attleborough Hall demolition started. In 1934 Camp Hill Hall was demolished. 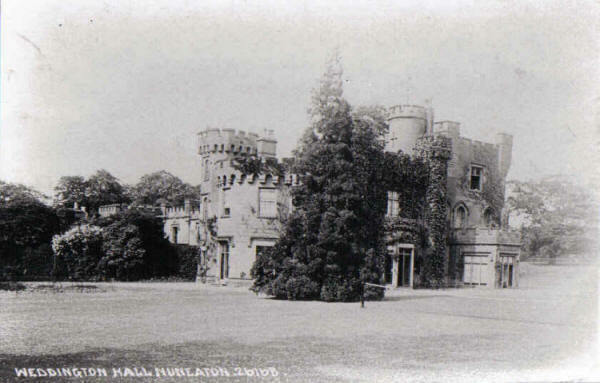 In 1942 Oldbury Hall was bombed (the ruins were finally demolished in 1949). In 1946 Caldwell Hall, Chilvers Coton was demolished. In 1978 Astley Castle was gutted by fire and became a ruin. Among the few buildings that have survived to the present day are the impressive Arbury Hall and Caldecote Hall (which is now converted to private flats). Others, such as Merevale Hall and Maxstoke Castle, survive as private residences. 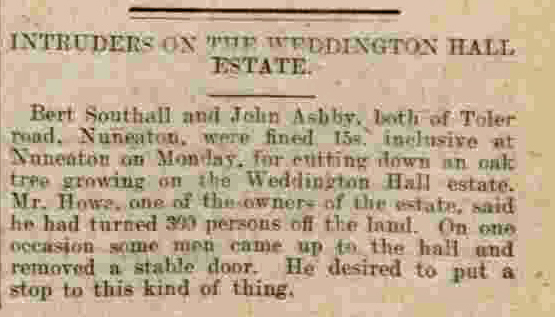 Judging by this newspaper report from 1926, pilfering on the derelict Weddington estate was rife before it was demolished. 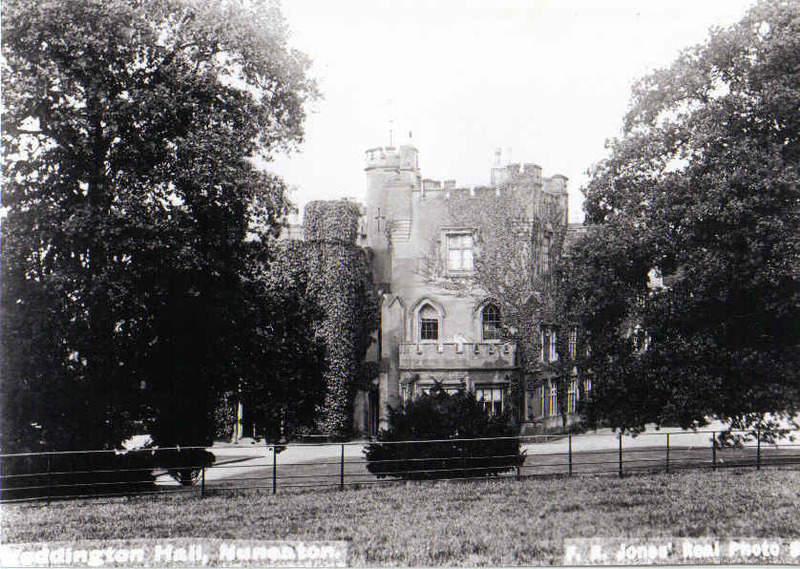 In 1928, on the 6th July, a notice of sale appeared, and the announcement made that Weddington Castle was to be demolished. On the 19th October 1928 - after a rich and varied history going back almost 1,000 years - Weddington Castle was razed to the ground.